Rockin’ Eco Hero – Steve Trash is a multi-award winning theatrical artist. Born in San Angelo, Texas, but raised in Alabama (Bay Minette, Montgomery, and Florence), he’s always had a passion for two things: theatre and the environment. After graduating from the University of North Alabama with a Degree in Theatre he moved to New York City. In “the city” he continued his theatrical studies and “busked” or “street performed” in Central Park and Washington Square Park to make money. He began integrating “found object trash” into his shows and this idea eventually grew into a globally popular theatrical show. He’s appeared in Japan, Australia, Canada, Spain, Portugal, and theatres (and schools) all over the United States. In 2000 his play “TRASH” was selected “Best of The Weekend” by the Los Angeles Times. He went on to create a regional TV show on Comcast Cable in the 1990’s. He moved into writing, directing, and producing short films and eventually won a “Sweet Home Alabama” award for his short “The Burgler”. He currently tours with two live shows. The Science of Ecology Show and Trash & Recycle Show which are great examples of taking an idea “reduce reuse recycle is great for the environment” and making a world class theatrical presentation from it. His original concept was to make a magic show completely out of trash. This idea has grown and become a world class show that features original music (he plays a recycled cigar box guitar), garbage puppets that come to life on stage, and amazing illusions made completely of trash. 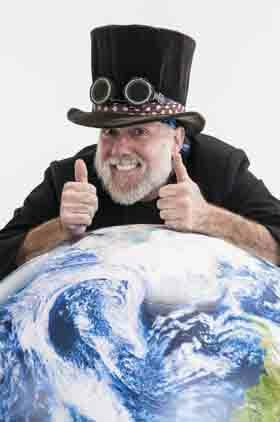 In 2011 he was awarded the EEAA – Environmental Educator of the Year Award, his Trash & Recycle Show was awarded the Outstanding RC&D Project of 2007, and made the Mother Nature Networks – Top Eco-Comedians list in 2009. He’s appeared at the world famous MAGIC CASTLE in Hollywood, California, was a featured guest on LeVar Burton's READING RAINBOW MAGIC WEEK, and was the featured green entertainment at the 2011 KEEP AMERICA BEAUTIFUL - Great American Cleanup" national kickoff in Times Square - New York City. Tours internationally and nationally year-round. Available for live shows, workshops, residencies and professional development.